The Napa Valley Wine Train isn’t so much a mode of transportation but rather a time machine transporting passengers back to an era when the journey was as scintillating as the destination, itself. Particularly well-suited for couples seeking quality together time, this excursion offers an elegant sojourn through the heart of Napa Valley in a refined, history-rich atmosphere befitting the lush countryside through which it passes. Duly complementing the drop-dead gorgeous vistas are gourmet victuals and varietals-a-plenty. Having been aboard with my own loved one, I dare say the Napa Valley Wine Train is among the most romantic experiences you can have while in this revered region. The train itself is a wonder to behold. The expertly restored and maintained antique Pullman cars gleam with brass and Honduran mahogany while etched original glass and swanky armchairs evoke the early 20th century spirit of luxury travel. One of the few active historic passenger railroads remaining in the United States, the Napa Valley Wine Train offers a tempting variety of tours, events and packages, including gourmet dining experiences for both lunch and dinner. Of course, fundamental to the Napa Valley Wine Train is the route, itself, which takes passengers through the heart of the winery district. The round-trip tour starts in the downtown area and meanders its way through Yountville, Oakville, Rutherford and Calistoga, passing directly by such revered wineries as Opus One, Cakebread, Domaine Chandon, Grgich Hills and a host of others. With seemingly endless rows of grapevines in the foreground and foliage-laden rolling hills beyond, the scenery is utterly breathtaking and worth the price of admission alone. However, the splendor outside the windows is duly accompanied inside the train by the posh retro-chic décor, impeccable customer service and an elevated food and beverage program that would delight even a hardened epicure. Indeed, dining on the Napa Valley Wine Train is not incidental, but rather an integral part of this indulgent multi-sensory experience. The train features four separate dining cars, but the two-story Champagne Vista Dome Car in which I travelled provides a truly distinctive dining experience. This luxury glass-domed observation car is a 1952 antique Pullman rail car that is accessible exclusively to guests with reserved seating, inaccessible to passengers in the main cars. The intimate setting accommodates only 56 guests at a time and can also be reserved for private events. Lunch is served on the Vista Dome car as well as two others: the Silverado Car and Gourmet Express car. Each has its own kitchen and dedicated menu, with the Vista Dome offering the premier experience of the three. 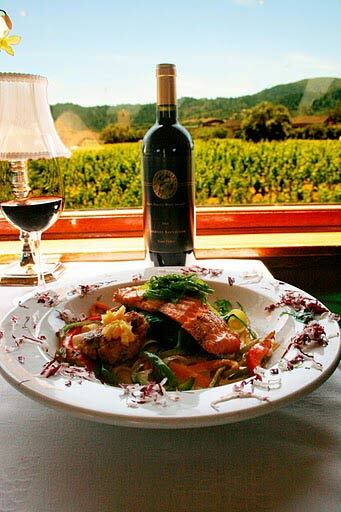 Each meal on the Napa Valley Wine Train is prepared to order by award-winning chef, Kelly Macdonald, and his brigade who work culinary wonders from compact but highly efficient on-board galleys. Dinner is available on the Vista Dome or Gourmet Express cars. As with lunch, menu items are prepared to order and feature fresh, environmentally responsible ingredients that are locally sourced to the extent possible. During spring and summer, dinner passengers delight in the Napa Valley landscape bathed in the golden twilight sunshine, while during autumn and winter the dinner train departs after sunset, ramping up the romance and adventure factor of being aboard an antique train traveling through the dark. My guest and I hopped aboard the Vista Dome Premier Train for a seasonal lunch package offered on select weekdays throughout January and February for $154 per person. The experience surpassed what I had hoped and imagined. This elite train serves the same fine dining menu of the traditional Vista Dome experience that’s available throughout the year (also priced at $154 per person, increasing to $199 on March 9). It connects only the Champagne Vista Dome Car, Grappa Power Car (believed to be the only power car in existence that passengers can enter and walk through while in operation), a 100-year-old Lounge Car and the rarely experienced Deli Car—far fewer cars than the usual Wine Train. Perfect for couples, the privacy factor was enhanced vis-à-vis a more intimate venue with seating limited to just 56 passengers in total. While I anticipated the beauty of the region we traversed through to enthrall, which it did in droves, the authenticity of this semi-private train transport in concert with the quality and creativity of the culinary program exceeded all expectations. The 3-hour odyssey began with a welcome glass of California sparkling wine, to be enjoyed while settling into the plush booth seating and taking in the stellar surroundings. From there, a thoughtfully conceived four-course menu ensued, on this day commencing with a choice of Flourless Yam Ravioli or Smoked Salmon Crêpe, then continuing with an appetizer course selection of Red and Green Endive Salad or the Soup du Jour, which was a rich and creamy Lobster Bisque. Of the multiple entrée selections proffered, my guest and I opted for the Roasted Beef Tenderloin, served in a Cabernet reduction on cambozola toast alongside a sautée of vegetables, as well as the Special of the Day: a lightly-seared Tuna Filet. Other scintillating entrée options included Grilled Local Lamb Chops in a rosemary-garlic bérnaise, a Grilled Salmon Filet topped with lemon-basil pesto and Seasonal Vegetable Risotto topped with a sweet potato stuffed gypsy pepper. The grandiose gastronomes continued through dessert, as we reveled in an Espresso Crème Brulée and a White and Dark Chocolate Cheesecake served atop a brightly flavored raspberry coulis. Not only a conceptual success, the execution of this menu was on point with perceptibly fresh, top-quality proteins and produce that was all skillfully prepared and plated. As goes without saying, the wine offerings on the Napa Valley Wine Train are ample, and impressive given the space restraints. With approximately 30 varietals to choose from, there is something for every oenophile’s palate. Or, passengers can bring their own bottle on board for a nominal $15 corkage fee. Those hankering for a social vibe can hit the bar car where wine and champagne flights are available—those pre-planned by on-staff staff wine experts or mixed-and-matched by passengers preferring to custom-create their own tasting experience. In fact, passengers are encouraged to get out of their seats and explore each the train’s various dining and lounge cars and also visit one or both outdoor observation decks where they can take lovely keepsake photos and generally bask in the fresh country breeze. In addition to the lunch and dinner packages, the Napa Valley Wine Train also offers winery tours—five to be exact. If amour is top-of-mind, the Castle Winery Tour is perhaps the most romantic. Passengers enjoy a gourmet lunch before attending a two-hour wine tasting at Castello di Amorosa, which literally means “Castle of Love” in Italian. The winery is an authentically-styled 13th century Tuscan castle located on 30 acres of estate vineyards. Other tours include an evening wine tour—the only such tour offered in Napa Valley—as well as tours of popular local wineries such as Raymond Vineyards, Charles Krug Winery and Grgich Hills Winery. In addition to the wine tours, the Napa Valley Wine Train boasts a calendar packed with fun events including holiday-themed trains and murder mysteries. Moonlight Escapes take place at sunset during a full moon making for an extra romantic ride. A gourmet dinner is included, of course. The Napa Valley Wine Train isn’t just a train ride—it’s an institution that echoes the glory days of train travel, with fine dining service, multiple course meals cooked to order, Napa Valley scenery and ultimate relaxation aboard an exquisitely restored vintage rail car. Book this experience and you’ll be on track for a spectacular time.